Welcome to A+ School Rewards! 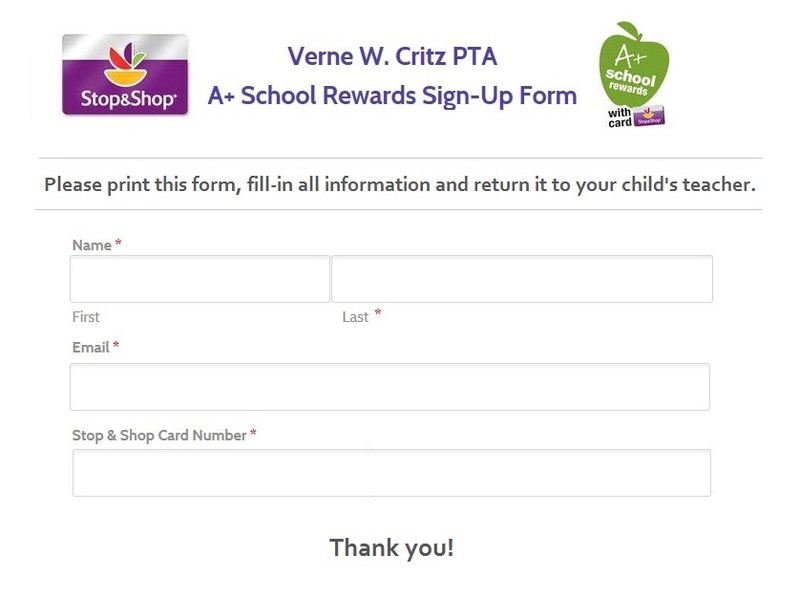 Starting October 3, 2016 through March 19, 2017 Verne W. Critz will have the opportunity to earn cash through Stop & Shop A+ School Rewards Program. Register your Stop & Shop Card and earn A+ School Rewards points every time you shop! REGISTER ONLINE: go to www.stopandshop.com/aplus. (first 3 letters of you last name and your stop and shop card number). Enter Verne W. Critz ID# 17324 and then hit "register"
information and we will register the card for you! Click here to access our form. Please fill it out the required information and submit it to us. Just print it, fill it out, and then send it to school with your child. After you register your card, use your Stop & Shop Card to earn CASH for our school! Each month, the amount of cash awarded will be updated on the Stop & Shop website. Enter the school ID# 17324 to view the school account totals. The amount of points earned for our school will also be on your grocery receipt and online when you create an account at www.stopandshop.com. Our school will receive a check at the end of the program. The money can be used for any of our school’s educational needs. Please encourage your friends and relatives to register their cards. It could mean more Cash for our school!